HERSHEY, Pa – The economy is thriving amongst toy and coin-op collectors, according to USA Theatres, producers of the upcoming American Antique Toy & Coin-Op Show, who just announced that buyers will be coming from overseas to seek out American made antique toys and coin-operated machines. “We have received several emails from collectors overseas who will be attending the show,” said Ronald M. Vastola, Outreach Coordinator of USA Theatres. “Buyers will be coming from the UK and Netherlands”. Buyers will have the unique opportunity to acquire extremely rare, hand-painted turn of the century toys, not only made in the US, but imported from France and Germany by renowned toy dealer Lionel Fournier, owner of France Antique Toys. If what was said, so far, doesn’t impress you, just check out some of the recently revealed dealers who will be exhibiting at the event. Alan Green, owner of American Jazz Antique Toys, will be bringing some of his finest inventory of merchandise, followed by Mike Caffarella, of Lancaster, Pennsylvania, who will be offering early American tin toys, mechanical toys and banks. 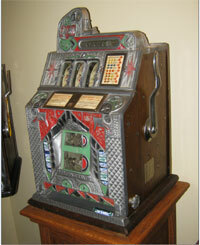 Additional exhibitors will include Mark Schlesinger, of New Jersey, who will be bringing some antique penny arcades, occupying 16 ft. of exhibit space with Ken Schnoll, owner of Antiques Slots, who will be offering an array of antique slot machines and other coin-op related items. If this still doesn’t impress you, here’s something to chew on… Rich Brinkos (a/k/a The Gumball Guy) will be loading up his truck with all sorts of antique and vintage gumball machines, while exhibiting next to Larry Garland, who will occupying 24 ft. of exhibit space to accommodate antique jukeboxes, pinballs, trade stimulators and other rare toys and collectibles. Exhibitor Bob Adams, of Connecticut, will also be occupying 24 ft. of exhibit space to display antique amusement items, advertising items, and coin-ops, to name just a few categories. A new addition to the show is exhibitor Tom Sage, Sr., of Allentown, Pennsylvania, who is one of the best-known antique toy dealers in the world. More quality exhibitors from New York, New Jersey and Pennsylvania, who specialize in antique and vintage collectibles, have responded to the show; including Ken Farrell, owner of Just For Kids Nostalgia, who is interested in utilizing 16 feet of exhibit space. Those who are seeking vintage toys and memorabilia will be able to choose from a variety of dealers, including Wex Rex, Heroes Unlimited, and Milo Toys & Collectables. “Exhibitor space inside the auditorium of the Civic Center is sold out,” Vastola said. “We are now expanding into a second exhibit hall”. General admission into the event is $10 for adults and free for children under 12. Early buyers are welcome Friday evening at 6:00 p.m. and also Saturday morning at 7:00 a.m. for $20 per person each day. Parking is free. Attendees are encouraged to come hungry, in order to taste a variety of food and beverages offered for sale by Joemomma Foods, Inc. of Hershey, Pennsylvania. “Joemomma Foods of Hershey will be offering dinner on Friday evening and breakfast and lunch on Saturday,” Vastola said. “This will be a nice treat for everyone,” he added. For hotel accommodations, everyone is encouraged to contact the Hilton Stamford Hotel & Executive Meeting Center, the official hotel of the American Antique Toy & Coin-Op Show. The hotel is conveniently located just 1.4 miles, 4 minutes from the Eastern Civic Center. Mention the show to receive a special room rate of just $79 per night (promo code: AMA). The hotel can be reached by visiting their website www.hiltonstamfordhotel.com or by calling them directly at (203) 967-2222.